The top managers of the Boryspil International Airport (Kyiv) have decided to change the status of passenger terminal F and use it as a cargo terminal in the future, the press service of the airport has reported. "Today, the airport is the leader in servicing aviation cargos in Ukraine. In the future it is expected that cargo shipments will grow, which is linked to the attraction of new airlines, in particular, Emirates, and Swiss International. Taking this into account, the airport requires a full revision of the existing infrastructure for cargo servicing," the press service said, citing Boryspil Airport Director General Oleksiy Kochanov. 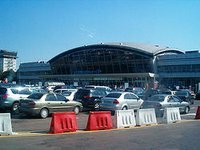 Boryspil airport said that the advantages of terminal F, such as the possibility of organizing a cargo business center, zones for servicing cargos, warehouses under one roof, its proximity to the existing cargo terminal, the availability of a cargo apron and the possibility of expanding the transport hub, will allow an efficient scheme for cargo servicing to be set up. As a part of the concept drawn up, it is expected that the export/import zone, the three-level shelf system (600 kilograms per square meters) and a customs zone could be placed on the first floor of terminal F. Offices premises, premises for staff servicing, the two-level shelf system (450 kilograms per square meters) could be organized on the second floor. As reported, from October 27, 2013, all international charter flights at the Boryspil Airport will be transferred from terminal F to terminal B. As reported, referring to the deputy director general for exploitation of the airport, Serhiy Hombolevsky, Terminal F, which today services charter flights and low-cost airlines, is to be mothballed. Several concepts are being studied, including its reorganization into a cargo complex. Hombolevsky said that Terminal F is not used at full capacity today. It services three or four, sometimes eight, flights a day. He added that if Ukraine joins the Single European Sky, the number of low cost airlines could considerably grow at the airport, and then Terminal F could be used as a terminal for servicing passenger flights. Boryspil International Airport is the main airport of the country and provides 65% of passenger air transportation in Ukraine. It is the only airport in Ukraine that performs transcontinental flights. The airport has two runways: one with a length of 4,000 meters and a width of 60 meters, the second – with a length of 3,500 meters and a width of 63 meters.